Who's Holding the Stick: First of all, I am so relieved to have somebody take over for me today since I'm busy getting the kids off for their first day back to school. I mean, come on school corporation - it's still summer! Popsicles are still lining the freezer... So, hooray for Wednesday! I'm very excited to welcome my friend Alyssa from Everyday Maven back (she was also here during the 12 Weeks of Winter Squash)! Take a gander at these beautiful frozen treats on a stick! Deciding which popsicle to share with you was extremely difficult. As a mom to a 3.5 year old, we seem to have an endless supply and variety of popsicles in our freezer. As you can imagine, they range from creamy, rich and fruity to icy and refreshing. Then there are the adults only pops spiked with booze and/or coffee. Throw in the fierce competition that has graced these pages every Wednesday since #SummerOfThePopsicle returned and you have one hard decision! As I was wrestling with which recipe to share, it became obvious when my son asked me for an ice pop the other day. He asked me for one of the Triple Berry Ice Pops that have been a summer staple regardless of what other concoctions have come and gone, we always have these. 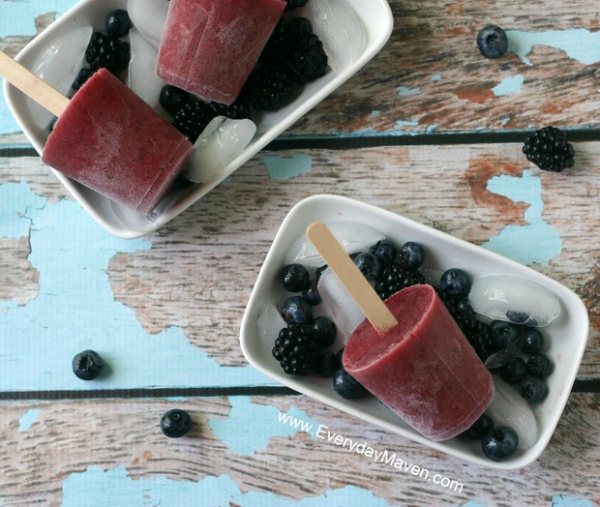 These Ice Pops are refreshing, light and beyond easy to make. All you need is a blender, some berries, a splash of coconut milk, coconut water, a touch of honey (or maple syrup) and a pinch of salt. I like to make these in Dixie cups as they are the perfect size for little hands and not so big that they ruin my son’s dinner appetite when he wants an afternoon snack. Enjoy and thanks for having me Heather! P.S. These Ice Pops are Dairy-Free, Nut-Free, Paleo and Vegan Friendly (if you swap Maple Syrup for the Honey). 1 Points Plus Each. Grab a small baking sheet or large flat plate. Line up the Dixie Cups and set aside. Combine coconut water, coconut milk, sea salt, honey and mixed berries in a blender jar or bowl of a food processor. Process until completely liquefied. Pour berry mixture into Dixie Cups. You have two options for when to add in the wooden popsicle sticks. You can wait about 30 to 45 minutes when the popsicles will be slushy and not yet frozen but sturdy enough to hold up the sticks and insert them OR cover each Dixie Cup with a small piece of tinfoil and place the stick through the center prior to placing in the freezer. Personally, I usually do the first method unless I am running out of the house and won't be around 45 minutes later to place the wood sticks. Allow the pops to set for a couple of hours (4 to 6). When ready to eat, use a scissors to snip the Dixie Cup and then just unpeel it off and discard. 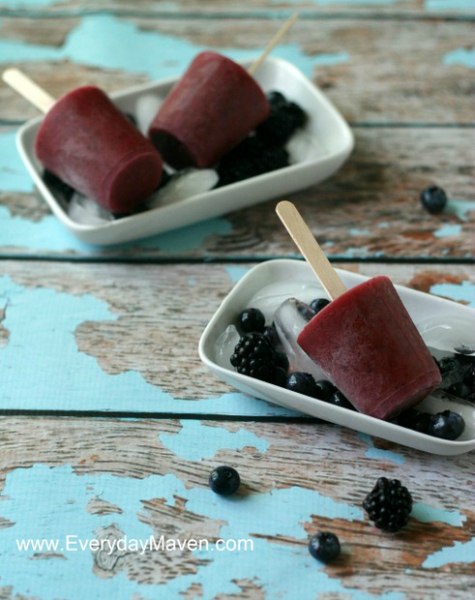 These Ice Pops are only as good as the fruit you make them with so make sure your fruit is naturally sweet and super ripe. Taste the mixture before pouring into the cups and adjust sweetness at that point as the frozen version will be very close to that. I used a combination of blackberries (2 ounces), blueberries (4 ounces) and strawberries (4 ounces). Any berry combo will work but if you use blackberries, strawberries or raspberries and want a smoother popsicle, strain blended mixture through a fine mesh strainer before pouring into the cups.